WhoisVisiting is a lead management software solution that identifies B2B visitors on your website, and provides insights and contact information for your company. Websites are no longer just looking towards getting great traffic, but also looking up for ways to generate potential business leads. WhoisVisiting is designed to help businesses gain the competitive edge by looking deeply into the visitor profile and interests such as company website, phone numbers, and details of what they are looking for, how long they stayed on the website and what company pages they visited. Thereof, you won’t simply count numbers, but depict the ‘actual identity’ of your visitors. 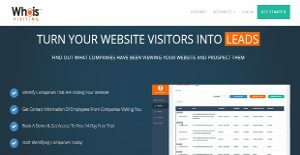 This SaaS tool presents and tracks the visitor details in real time, which means that they can be contacted to close some potential deals as soon as they visit the website. The immediate action allows achieving the goal of Conversion Rate Optimization (CRO). With WhoisVisiting, tracking your unknown website visitors has never been so easy and efficient. When the B2B visitors lands onto any page of your website, you can immediately identify them with their company’s contact information. This helps you gain insights about the visitors’ profiles, the actions they perform, and the website pages that interest them. By gathering this data, a business can convert the unknown visitor into leads and then to customers by taking the proper course of action. If the concept of generating leads through this software seems alien to you, then get the know-how of the tracking reports generated by WhoisVisiting. The entire raw visitor data gathered is categorically placed into real time reports, such as the ‘hot leads’, ‘ignored visitors’, and much more. So, if a visitor lies in the category of ‘ignored visitor’, that means that it doesn’t qualify to be a lead since it can be any government or charity organization showing up for non-commercial purposes. Therefore, these categories help perform the suitable actions on the immediate basis, with the primary aim to retain the interest of potential leads. Also, businesses can measure the effectiveness of their marketing efforts by closely tracking the types of visitors and the navigational courses of actions performed on the website. Consequently, businesses get a clear idea about the efficacy of their customer relationship management, Return on Investment (ROI), Conversion Rate Optimization (CRO) and lead generation. It is essential to keep in mind that hardly any software in the Conversion Rate Optimization Software category will be an ideal solution able to meet all the goals of various business types, sizes and industries. It may be a good idea to read a few WhoisVisiting reviews first as certain software might dominate exclusively in a very narrow set of applications or be designed with a really specific industry in mind. Others might function with an intention of being easy and intuitive and as a result lack complicated elements welcomed by more experienced users. You can also come across apps that focus on a large group of customers and provide a complex feature set, however that in most cases comes at a more expensive cost of such a service. Ensure you're aware of your needs so that you pick a solution that offers specifically the elements you search for. How Much Does WhoisVisiting Cost? We realize that when you make a decision to buy Lead Management Software it’s important not only to see how experts evaluate it in their reviews, but also to find out if the real people and companies that buy it are actually satisfied with the product. That’s why we’ve created our behavior-based Customer Satisfaction Algorithm™ that gathers customer reviews, comments and WhoisVisiting reviews across a wide range of social media sites. The data is then presented in an easy to digest form showing how many people had positive and negative experience with WhoisVisiting. With that information at hand you should be equipped to make an informed buying decision that you won’t regret. What are WhoisVisiting pricing details? What integrations are available for WhoisVisiting? If you need more information about WhoisVisiting or you simply have a question let us know what you need and we’ll forward your request directly to the vendor.